Why Shouldn’t I Use Toothpicks? An expert dentist and spokesperson with the American Dental Association, Sally Cram, gives an analogy to her patients: “Would you take a stick and poke it into your arm?” The short answer is no. Toothpicks are okay to remove big chunks of food occasionally, but they should not take the place of regular daily flossing. Spaces between teeth: When a toothpick is used in the same spot frequently, it can create space in between your teeth. This leads to more food getting stuck and even cavities. Damages tooth enamel: Toothpick users tend to chew on the wood itself which can wear down enamel. Damages tooth roots: Heavy use of toothpicks can shift your gum down to expose more of your tooth’s root. This makes it much more likely to be damaged. Dentists can agree that the ideal way to remove food from in between your teeth is with dental floss. Flossing once a day removes leftover food stuck in hard to reach areas, but it also removes plaque that builds up in between your teeth. In addition to brushing, flossing plays an instrumental roll in preventing tooth decay, gum disease, and bad breath. For some, flossing can be hard. Whether you have arthritis or just have trouble handling dental floss, you can use pre-threaded floss holders that make cleaning in between the teeth much easier. For special cases, your dentist may suggest using tiny spiral brushes or a water flosser. This is an at-home tool that uses a targeted stream of water to remove plaque and food particles. 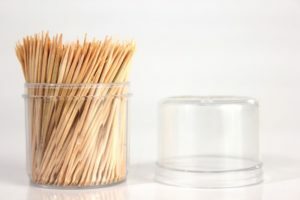 We know toothpicks might make you look cool, but they aren’t a sustainable tooth cleaning method. Next time you want to reach for a pick, grab the floss instead to keep your mouth healthy and happy. Dr. Marc Mingel is a general and cosmetic dentist that enjoys helping his patients practice good oral healthcare. His patients enjoy his friendly and easy-going attitude when they visit his office. He currently practices at Mingel Dental and can be contacted by phone at (954) 566-1548 for any questions.